From cheese to chips, wine can be paired with nearly any snack or food items. 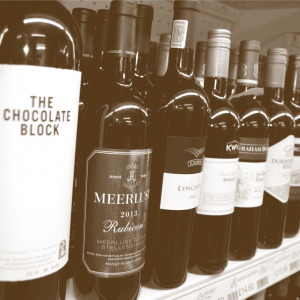 So let’s combine South Africa’s two favourite things; Biltong and Wine. 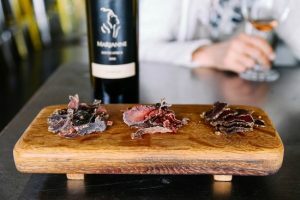 This guide will help you at your next dinner party to throw an impressive biltong and wine pairing, to dazzle your guests with your new found vino knowledge or host a romantic night in with your other half. Let’s help you get your drink on. A deliciously smoked biltong, made from finest grass fed scotch beef and gently spiced with coriander pairs excellently with the oaky aroma of Shiraz. The wine has a smoky, charred fruit flavours and chewy tannins that are delicious with this succulent beef, exposing its natural sweetness. With dry, lean meat that’s boasting intense gaminess, this Venison biltong is perfectly balanced by the hints of musks and cherry. The translucent, purple-ruby appearance also makes for an attractive wine. Biltong and wine pairing doesn’t get better than this! A shorter drying out period results in a pleasantly succulent, flavourful and juicier meat with a complex taste, perfectly complemented by the sweeter notes of this Pinotage. This particular pinotage is a bold, full-bodied red wine; This vintage has a soft palate of berry, fig and just a hint of spice. So, what do you prefer, Beef or Venison Biltong with your vino? Get social and let us know on our social media!